The Faux Whitetail Deer Antler Table Lamp is fashioned from two deer antlers. The antlers used to create this lamp were cast from current Boone and Crockett World Record whitetail deer then hand stained and painted to create a realistic look. 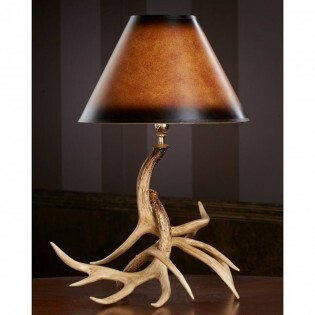 This lamp is covered with a unique two town shade that perfectly compliment the colors and look of the antler base.